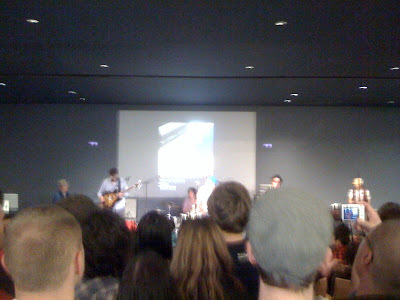 Okay okay I was at the Apple Store in Soho, but hey it was a free show with Dr. Dog, playing songs off their new album, Shame, Shame. I hadn't actually heard any of their music until the night before when I brushed up on them in preparation, but I was really happy with what I heard. They reference a time in music history when rock was real rock, when musicians were talented and knew their way around their instruments. It was a refreshing sound, and I am definitely going to pick up their album. You should too! Btw, the ipad is a clever marketing ploy don't fall for it!